October 19, 2013 Journal Entry – Today I’m seizing the moment and writing a fresh entry versus rewriting old notes from another day. I have mentioned the BB story to a few people in passing, and if you had read the post called Endless Hope, Oct 13th Journal entry, I alluded to it. Here it is. About 8 weeks ago we moved from our house into a beautiful little 600 sqft apartment. We have 1 teen at home, 1 graduated and living out-of-town, and 1 in heaven – so our previously-chaotic household of 5 is all of a sudden down to 3, and it just made sense to move to a small place – we do love it here! (I’ll save the bit about the freedom we’ve found by ditching debt and enjoying simple living for another night though). My creative friends that helped unpack the kitchen decided to place out a set of 3 little square ceramic dishes on a matching plate as décor and catch-all for keys, etc. It’s a great idea and looks pretty neat – I never would have thought of it personally. I’m more of a push-all-the-furniture-symmetrically-against-the-wall kind of person, and my idea of decorating or staging a house ends up looking like I’ve stripped it bare. Ha-ha, that’s why we need each other I guess hey? Well if you look close in the 3rd ceramic dish on the right….you’ll notice a tiny white ball of plastic…kind of dirty looking maybe…but if you’re ever over and helping tidy the kitchen, please don’t chuck it in the garbage!!! I’d probably cry if I ever noticed it was missing! Generally I don’t care about “things”, it’s all just stuff that is replaceable. I do however get sentimental about a very few things, because of the deeper meaning they have however. Take the piano in our little living room, it is a family keepsake that reminds me of my young uncle that passed when I was about 5 and he was about 21. The hope chest my parents gave me is in our storage room at the moment, too big for our bedroom, but was a very special gift and when I was a teen I filled it with precious things like dishes I was collecting for when I got married, dried flowers and hundreds of letters from my sweetheart that I hoped to marry (and did). Later I added to that cedar lined chest tiny clothing from when our kids were babies. Other than that the only things that seem irreplaceable to me are the photo albums, external hard drive backup of digital photos, home videos, and maybe my wedding dress & cake topper. Ok, yes there’s also the scrap books of kids projects, and a few heirloom dishes of course, can’t forget those. I’m not a hoarder of material things, I have purged it all over the last 3-4 years, but I certainly am a sentimental I guess. Life has been so busy for so long and I realized early on in our family life that there was no way I’d remember all the precious details and moments without some of these prompts. I’d try to get the kids to write a little page each day if we ever went on a holiday, so they could remember a few special details from each day that we would have otherwise forgotten by the end of the week. Life just does get to be a blur. I found myself so busy trying to keep things organized the past 19 years since we started having kids, (well at least organized chaos), while juggling working outside the home and extra involvement with music especially when the kids were younger. Then they had soccer and birthday parties, and then youth activities – the list of to do’s was never-ending. There was never a spare hour where I’d say to myself “oh, what should I do now?” but rather was always scrambling to keep some semblance of order, tidiness and clean laundry. The family team was what I liked to call it, as we tried to teach our kids the skills on how to do their parts of these chores along the way to keep things going. Everyday it was about working together to make food, ensure homework is on track, and my constant reminders to “please clean up after yourself” and not leave a path of destruction. (and all the mom’s reading say “AMEN”). As a teenager Brandon was pretty tidy most of the time, no toys any longer left strewn around of course by age 15. He liked to pull his damp laundry out of the dryer after only about 10 minutes and hang it all up, so the clothes were now meticulously cared for as well. In the summer of 2011, less than three months before his sudden passing, we had downsized a bit and moved into a different house in the neighborhood. He had a nice big room, and set it up with the bed against the wall so it ooked clear and open. He and his friends had been into airsoft BB guns that year and would go out in a near by forest and chase around with them, having the time of their lives. When he needed to restock on those little plastic BB’s for the first time that summer , I was surprised to find out they came in boxes of 5000! I was even more surprised to come upstairs one day to find him sitting on the floor of his “tidy” new room with all 5000 of those blasted BB’s dumped out on the floor! He was happily swirling them around on the carpet and they were rolling around the whole room – coulda made snow angels in them! Of course in my shock I said something like “what in the world are you doing? !” and “you better clean these up Bran” and “do you realize I’ll be finding those things around the house forever? !” He just shrugged, and with a twinkle in his eye just continued almost swimming in them. (ha – makes me giggle now). It was a moment when his organized mind gave into the fun-loving kid inside him. The next day I noticed he had put them all away and at the time I was relieved and thanked him. About eleven weeks later he was gone. At the end of the viewing at the funeral home, I think I recall for some reason those bb’s were there with a bunch of his stuff on display, and I seem to remember pouring the whole box into the casket just before we left. Sometime in the next months I was in cleaning his room, and pulled out his bed, night table and shelf, vacuuming all the edges by the base boards – time for a detailed job. It wasn’t until then that I found one of those crazy little plastic balls tucked in by one of the wheels/casters of his bed. 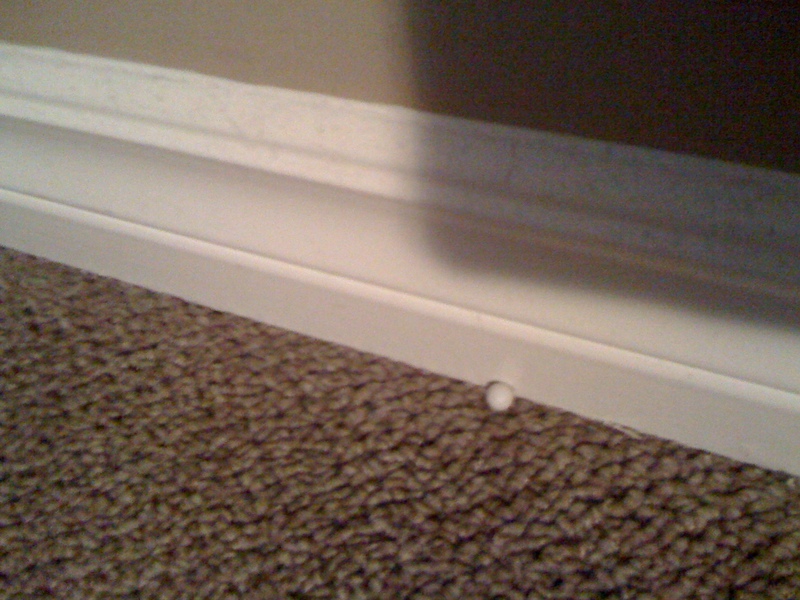 Then over in the corner behind the door, another one, and against another baseboard one last one. I melted into tears (much like now) realizing again how much I missed him…how much I missed his presence, how much I missed his teasing, how much I missed any previous mess he had made. In that moment I was so glad I was finding them around the house forever! I’d give absolutely anything to enjoy that crazy moment again – discovering the 5000 bb’s all over on the floor. Today I’d probably dive in, toss them in the air and spread them around with him until we got tired of it or he decided to kick me out for being too immature – haha! So I didn’t vacuum up those last few bb’s, I kept them in his room, tucked safely in corners I knew were pretty safe from being cleaned…and when we moved just a few weeks ago I took them with us to our new apartment. It’s amazing how loss affects our perspective. Things we couldn’t see before are clear and bright and glaring at times – like the need to enjoy the moments together and enjoy the mess. If you discover crayon drawing on the walls, ok clean up most of it, but maybe keep a bit and put some furniture in front of it – or at least take a picture. The clothes and books and backpacks and chunks that continue to creep back around the house after being put in their place – don’t get too crazy about it, yes teach tidiness, but somehow we have to savour that time when we have youngsters in the house to have stuff to even spread around! When life was too crazy I couldn’t appreciate these things either and longed for a future state of utopia where cleanliness prevailed at times. But now with the few hours and days I’ve had with no kids in the house off and on, it doesn’t get more fulfilling just because things stay in the place I put them. Appreciate the mess – it means something is going on that you will likely miss later! Appreciate the moment – every one of them passes and is gone, so seize this one! Although I haven’t been through what you have, my grandchildren are teaching me a similar thing. It can feel like chaos hits when they’re here. The house gets messy, things get spilled, broken, re-arranged, re-decorated, etc…but it’s so worth it to just let it happen and not worry about it too much. We have to enjoy the moments we have with them because that is the stuff is made of. The good, bad and ugly of it make up the memories we so enjoy. Good post, Janine! because that is the stuff *life* is made of. Lol…I need an editor! Have tears streaming down my face. So glad you are doing this Janine. It’s so true, we really don’t see the joy in even the messy things until it’s gone. Life is so short and precious, something I need to remind myself of daily for sure. Love you! You are such a blessing! Tears on my cheeks. Thanks for opening your heart to us all.